It is with great joy to offer the first Nyung Nay retreat at Ocean of Compassion led by Venerable Lhundub Chodron. 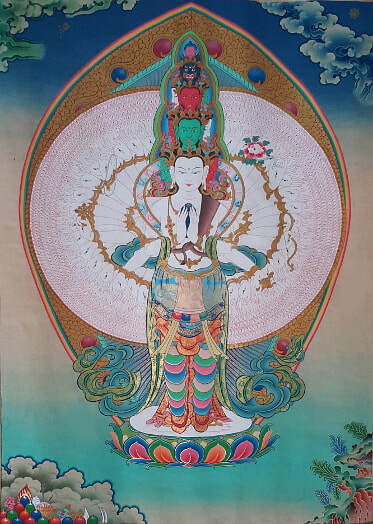 The Nyung Nay will occur during Lhabab Duchen, one of the four great holy days of the Tibetan calendar where merits are multiplied by 100 million times. Nyung Nay (or "fasting retreat" in English) is a Vajrayana practice from the kriya ("action") class of tantra. It is a powerful practice to develop compassion and bodhichitta — the mind that strives for enlightenment for the benefit of all beings. It is also a quick and effective method to purify negativities and collect merit. Meditators of the past have been known to purify such diseases as leprosy through this practice. Nyung Nay is a profound two-day practice relating to Chenrezig, the Buddha of Compassion. It is said that even one Nyung Nay or 'abiding in retreat' is as effective as three months of other purification practices. This beautiful practice involves the keeping the Mahayana Precepts, with the second day devoted to complete silence and fasting. The practice includes recitations of prayers, mantras, prostrations and guided meditations to Thousand-Armed Chenrezig. Register with a donation (use ticket form below). Download and complete the consent form and email it to director@oceanofcompassion.org. Retreat limited to 10 retreatants. You can also volunteer during the retreat to help with Day 2’s lunch delivery and/or preparation, set up and clean up. Please reach out at volunteer@oceanofcompassion.org. Since Ocean of Compassion is a non-residential center, we do not have rooms onsite. But those living nearby can commute during the retreat. To make this retreat possible to those living afar, we can arrange for an Airbnb stay and possibly transportation during the retreat -- if you need housing, please register by October 1st or contact us as soon as feasible. A full housing deposit will be required so we can secure the Airbnb housing. If you need to cancel and if Airbnb can refund a certain amount, we will refund that amount to you. However, until we know the rental terms ourselves, we cannot make this guarantee at this moment. In either instance, we encourage you to speak with family and friends in advance to inform them that you will be disconnecting (as much as possible) during this time so you can generate a retreat mindset during the Nyung Nay, especially for Day 3 of the retreat. The Buddha advised the "middle way" — not too soft, not too tough. During Nyung Nays we do experience discomfort, but it is bearable and not too tough. By experiencing this discomfort, we have a better understanding of the suffering experienced by animals, hungry ghosts, and some humans, and thus develop greater compassion for sentient beings, and greater renunciation of samsara — ​How Amazing! Abiding in The Retreat (order or download), a recently released commentary recently released by Wisdom Publications of Kyabje Lama Zopa Rinpoche. You can download a Word document for additional advice. You should be a Buddhist, having formally taken refuge in the Buddha, Dharma and Sangha. Those who have not formally taken refuge or who have not participated in Nyung Nay Retreat before, will need to have an interview with Ocean of Compassion’s director and/or the retreat leader. You should have taken the Great 1000-Armed Chenrezig Initiation, which will require taking the Bodhisattva Vows. If you do not already have a Great 1000-Armed Chenrezig Initiation, to participate in this Nyung Nay Retreat, you should have received a complete initiation (wang) from one of the three higher classes of tantra, or an initiation of one of the deities of the tathagata or lotus family of Kriya Tantra. You must be familiar with the Lam Rim (the Graduated Path to Enlightenment as presented in the Gelugpa Tibetan Buddhist tradition) and have attended at least one introductory course in Tibetan Buddhism. You must have read all information on this website about the Retreat and agree to follow the discipline of the Retreat, including fasting, strict silence, attending all sessions, and wearing appropriate clothing (no shorts or sleeveless shirts). If you have never done Nyung Nays before you must attend the introductory session on Friday night, where all the explanations of the practice will be given.